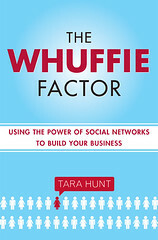 Over the past couple of weeks I’ve been dipping into Tara Hunt’s book The Whuffie Factor. I’d intended to write a post discussing the book in more detail, but a case study has just presented itself which brought my plans forward! Disclaimer: it’s worth restating that all content on this blog represents my personal opinion and my own experiences. The Whuffie Factor talks about the importance of establishing, growing and maintaining social capital in your market and with your community. The concept of “whuffie” is drawn from Cory Doctorow’s novel Down and Out in the Magic Kingdom (which I just started to read), which presents a world in which an individual’s social capital, or reputation for good deeds, is visible to others in an augmented reality, built-in heads-up display which everyone has. People can earn whuffie through good deeds and behaviour, spend whuffie in asking for favours, and lose whuffie in acting in some negative manner. Tara suggests that organisations and individuals that participate in online communities have exactly the same experiences, although whuffie itself may be less immediately tangible than in Doctorow’s imaginary world where everyone is wearing a whuffie badge. So, on to the case study. I’ve been an O2 customer for a long time. Before I got the iPhone 3G on UK launch day last year, I’d been an O2 customer on previous handsets and price plans. Actually, I had a relationship with the company stretching back to when they were BT Cellnet – a looong time. My experience with the iPhone has been wonderful. Ignoring the device itself (this post is not about that) – the tariff was reasonable, I had unlimited data at varied speeds anywhere in the UK, and access to two wireless hotspot networks, the Cloud and BT Openzone. Life was great. I believe it was the best deal in the world on the iPhone. Last month I decided to switch broadband suppliers, after Tiscali/Pipex were acquired by the Carphone Warehouse. Listening to the advice of many of my friends in the Twitterverse (Whuffie lesson – socially-connected individuals value personal recommendations above any others), it didn’t take long for me to select O2 as my new supplier. I felt comfortable with that, having had an excellent experience with their mobile service. I have to say the switch was painless and the service and performance of my new connection has been excellent. Just after the switch, I thought about getting a broadband dongle for my Mac. Naturally, as an O2 customer with two of their products, I thought I’d ask in an O2 store what kind of deal was on offer to loyal subscribers. “No special deal, sir” – I’d have to go with their regular package, which is far less competitive than T-Mobile, 3 or Vodafone (I only really wanted to use the 3G modem occasionally, so I didn’t want to sign up to a contract on that). Yesterday, Apple announced the iPhone 3GS. It’s an exciting device with some mouth-watering new capabilities – a better camera at last, a speed bump, voice recognition, a compass, and greater memory capacity. Oh, and it has the capability of being used as a 3G modem, which would mean I wouldn’t need a separate dongle for the Mac. Seems ideal. In short, I’d take one in an instant. I also discovered yesterday that O2 has a Twitter account, which I started to follow when I realised that it seemed to be a real person engaging in conversations, and not just a stream of PR pronouncements. There’s a wrinkle here, though. In order to take an iPhone 3GS on launch day, I’d need to buy myself out of the final 6 months of my existing 18 months contract (in my case I’m guessing that will be a straight 6 x £35, not cheap), and then buy the phone on a new contract. So the reward for loyalty and being prepared to sign up for a long contract is having to pay more for an upgrade to the new technology. People are also concerned about the cost of O2’s tethering plans, which don’t entirely surprise me given my 3G modem experience. A couple of people have noted on Twitter that those complaining about the situation are either whinging in general, or that they don’t understand the concept of a contract. In my case, I fully understood that I was signing on for 18 months – it just seems bizarre that it is non-transferrable and that I’m actually penalised for staying with O2. It’s not like I’m heading off to another network. Shane Richmond over at the Telegraph has an excellent summary of the issues, so I’m not going to pick through the situation point-by-point. Some of the commenters are right on the nail, too. The Twitterverse is fairly upset about all of this, with one person going so far as to set up a petition (I’ve not signed it, as twitition doesn’t use Twitter’s OAuth option for login). I phoned O2, at the suggestion of the O2 Twitter person, since “upgrade costs will vary”. The lady I spoke to claimed that no pricing information was yet available (odd, since there’s a page on the O2 website with that information), and then said that for upgrades, they were offering existing customers the option of downloading the new software onto their current phones, or buying themselves out of the existing contract. I’m disappointed. Right now, I’m actually thinking that the Palm Pre looks interesting. It’s a shame, as I’m an Apple user and I think the iPhone is an amazing platform – but O2 just jettisoned the good reputation that it had built up, and made themselves far less likely to be recommended by me in the future. End of case study. The conclusion here is that Tara Hunt has it completely right. In today’s social web-connected world, whuffie is important – potentially vital – for companies, as well as for individuals. How did I hear about Tara’s book? I’d been following her (@missrogue) on Twitter for a long time, recognised her as someone I respect and like through her great blog, HorsePigCow, and I was excited to hear about her book directly from the source. Here’s my personal recommendation: get hold of a copy of The Whuffie Factor, read, and inwardly digest. It’s a great, enjoyable book. I think you’ll like it, too. OK. Having followed some of the discussion on the @O2 Twitter channel today, my attention was drawn to the notion of the Priority List, which is an account feature I’d previously been unaware of, as I’d opted out of marketing material from O2. The only thing is, there’s no easy way to find out which “level” of priority my account was set at. I logged in to my account through the website, and found a contact number which got me through to a really helpful lady (evidently not the same number I’d called this morning, not sure what happened there). I explained that I potentially wanted to upgrade, and that I’m a customer of both a pay monthly tariff and the home broadband service. The customer service rep very helpfully and patiently went through all of the upgrade options with me… and it looks like it’s not quite as dire as I’d thought – my potential upgrade date is earlier than I’d feared, but I’m still unlikely to be getting an iPhone 3GS on launch day. So kudos to the helpful customer service staff, and I’m also impressed with the resilience and patience of the @O2 person. That has gone some way to restoring my opinion, even though I’m still disappointed with some aspects of the upgrade process. The Priority List is actually a way of rewarding customer loyalty, but it just hadn’t been on my radar. The final word on this, from my perspective, is that it’s still somewhat confusing, and I’d particularly advise O2 to make their Priority List stuff more visible and simpler to understand. I’d also suggest that people give them a call and check individual circumstances!